Beautifully Hand woven Blue colored Cotton Silk Box Gicha Saree Saree. Cotton silk material of this saree is soft, smooth and airy. Contrast blouse material comes along with this saree. Dry clean this saree for first wash. Low heat iron is preferred. Made from Cotton silk, this handloom saree is light weight and airy. 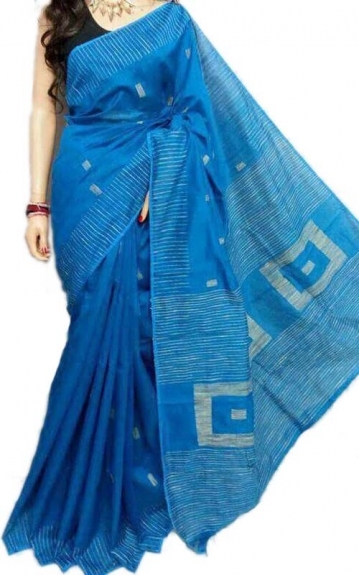 This Blue colored Handloom saree has simple Gicha box patterns on the body as well as the pallu. The saree border has thin stripes which enhances the beauty of the saree. The combination of Stripes along with the Gicha box patterns adds a trendy twist to this beautifully designed handloom saree. This beautiful handloom saree comes along with matching blouse piece. Accessorize this handloom saree with jewellery of your choice.